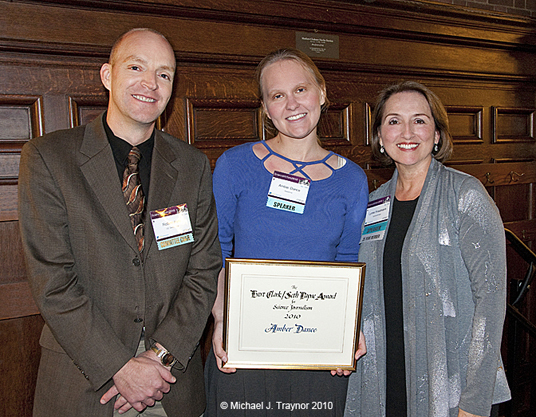 Dance was recognized on November 6, 2010, at the annual meeting of the National Association of Science Writers and the Council for the Advancement of Science Writing in New Haven, CT.
Dance received the award and its $1,000 prize for four stories: “Bacterial Waists: Bacteria living in our guts may play a role in obesity,” in the Los Angeles Times; “From Pond Scum to pharmacy shelf,” in Nature Medicine; “DNA Referees,” in the Los Angeles Times; and “Illegal Whale Meat Traced Back to Japan,” in Nature. The panel of judges cited Dance for her impressive package of stories, which showed her versatility and mastery of topics that ranged from epigenetics to intestinal fauna. The judges said that Dance brought the reader deep into complex subjects with engaging writing, good organization, and the use of colorful quotes. The story on pond scum was a particular favorite. Dance writes a regular health column for the Los Angeles Times, and she works half-time as a reporter for the Alzheimer Research Forum. She also writes for the Nature family of publications, among others. She has a B.S. in biology from Brown University, a Ph.D. in biology from UC San Diego, and a graduate certificate from the Science Communication Program. She completed internships at the Los Angeles Times (AAAS Mass Media Fellowship) and Nature before starting her freelance career. Dance is the third SciCom graduate to receive the Evert Clark/Seth Payne Award. Previous winners were Richard Stone in 1995 and Lila Guterman in 2002. Stone, a 1990 SciCom graduate, is Asia news bureau chief for Science, based in Beijing. Guterman, a 1998 SciCom graduate, reports for Chemical & Engineering News from Washington, D.C.